2012 March | Federation of North-American Explorers | Semper Parati! 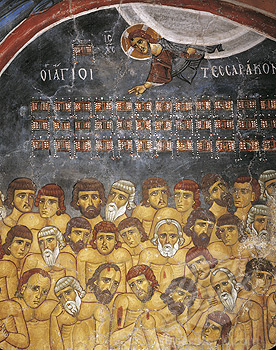 Our second Saint of the Month feature is on the Forty Holy Martyrs of Sebaste (you can read our first March feature on St. Thomas Aquinas here). The Forty Holy Martyrs of Sebaste were members of a party of soldiers martyred for their faith. They were martyred near Sebaste (then part of Armenia, now part of Turkey and known as Sivas), victims of Licinius, then Emperor in the Eastern part of the Roman Empire, who persecuted Christians despite the Edict of Milan granting tolerance to Christians throughout the Empire. Their feast dates to the fourth century A.D. According to St. Basil the Great, 40 soldiers who had professed themselves to be Christians were condemned by the prefect to be exposed upon a frozen pond near Sebaste on a bitterly cold night that they might freeze to death. Warm baths were prepared nearby for any who might be willing to abandon the banner of Christ. Among the 40 was one who yielded to this torture, departed from his companions, and sought comfort in the baths. When this happened, one of the guards set to keep watch over the martyrs saw brilliant light overshadowing them. He immediately proclaimed himself a Christian, threw off his garments, and joined the 39 soldiers of Christ in their martyrdom, thus fulfilling the number of 40. At dawn the frozen bodies of the martyrs, still showing signs of life, were burned, and their ashes cast into a river. Local Christians collected the precious remains, and the relics were distributed throughout many cities, and the veneration paid to the Forty Martyrs became widespread, and churches were erected in their honor. St. Basil, St. Gregory of Nyssa, and St. Ephraim the Syrian were all clients of the martyrs. Holy Martyrs of Sebaste, pray for us! 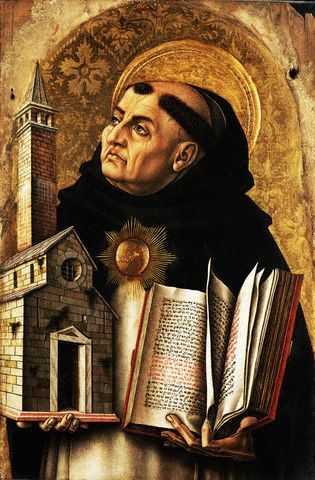 Since we skipped over the month of February, this month we will have two “Saints of the Month” features – one on St. Thomas Aquinas, the Angelic Doctor, and another on the Forty Holy Martyrs of Sebaste. St. Thomas Aquinas is a Doctor of the Church and patron of students and universities. His feast day on the new Calendar is January 28 (March 7 on the old Calendar). He was born in 1226, the son of Landulph, Count of Aquino. When he was five years old he was placed in the care of the Benedictines of Monte Cassino. In 1243, when St. Thomas was 17, he joined the Order of Preachers despite his family’s opposition. Like his contemporary St. Francis of Assisi, St. Thomas wished to renounce material things and live the life of a mendicant. Some members of his family tried to put a stop to his vocation, going so far as to lock him in a tower and sending a wayward young woman to tempt him. Their efforts failed (two angels came and girded him with a miraculous cord of chastity), and St. Thomas, upon being freed, immediately made his vows as a member of the Dominican Order. After making his religious profession, he studied under St. Albert the Great. His classmates nicknamed him the “dumb ox” because of his size and his quiet demeanor, but he was a great student. He published his first works around the age of 22, when he was appointed to teach in Cologne. After four years he was sent to Paris and ordained, and five years later he received his doctorate. In 1261, Urban IV called him to Rome where he was appointed to teach, but he would not accept any ecclesiastical dignity. St. Thomas not only wrote, but he often and with great fruit. Pope Clement IV offered him the archbishopric of Naples which he also refused. He left the great monument of his learning, the “Summa Theologica”, unfinished. He died in 1274 at the Cistercian monastery of Fossa Nova after falling ill on his way to the Second Council of Lyons. St. Thomas was canonized in 1323 by Pope John XXII and declared Doctor of the Church by Pope St. Pius V in 1567.